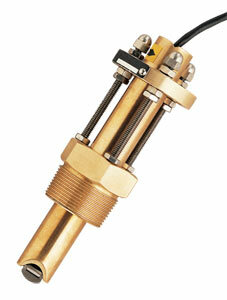 Flow Sensors for Lines 1½" to 36"
The FP-6000 Series has been discontinued. Please see the FP6500 Series as a possible alternative or contact our Flow Engineering department. When you want it all in one flow sensor, you want the FP-6000 sensor. accuracy...durability versatility... easy installation... low cost - the FP-6000 gives you all this. The FP-6000 accurately measures a wide variety of fluids with flowrates as low as 1.6 feet per second up to 20 feet per second. It generates a sine-wave frequency output linearly proportional to flowrate with ±0.2 fps accuracy. The FP-6000 is versatile, adjusting to various pipe sizes. There is no need to buy a different sensor for every change in pipe size. You can position the FP-6000 to give you accurate readings in any size pipe (1½ to 36"), permitting tremendous cost savings. No special fittings are required. A standard 1½" threadolet or saddle fitting is all you need. Made of rugged brass, the FP-6000 can handle harsh environments. The output signal can be sent up to 30 m (100') without amplification. Each FP-6000 sensor comes with a 7.5 m (25') cable and all necessary mounting hardware.